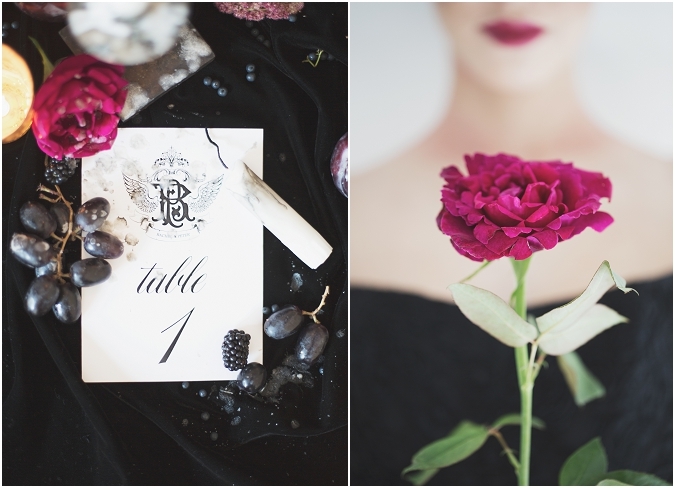 Today, I’m super excited to share with you our fourth styled shoot, achieved in collaboration with some of Bride Club ME’s vendor club members. 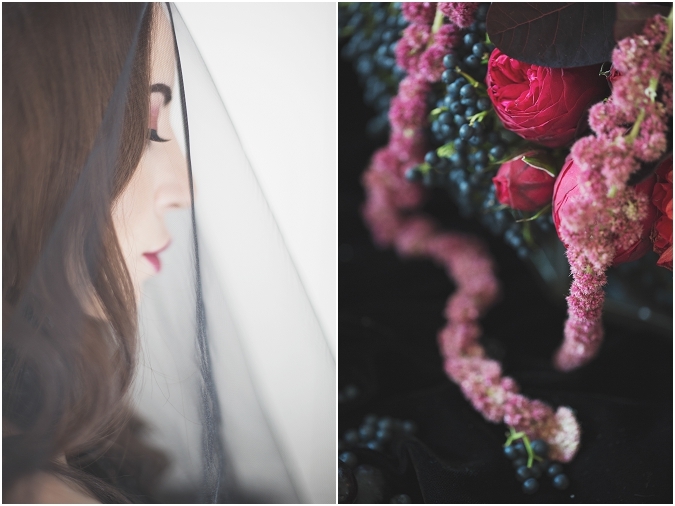 “Gothic Romance” was captured by the incredibly talented fine art photographer Melissa Beattie, and I’m sure you’ll agree is a beautiful shoot, quite different from any other we have done before. 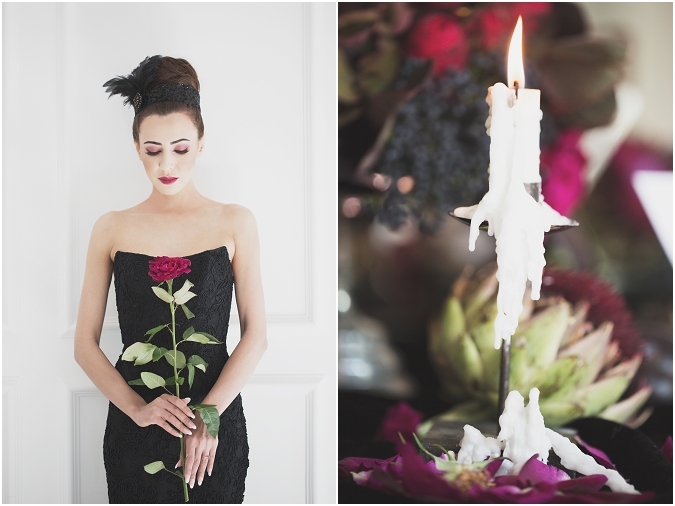 With halloween approaching, my vision was to create a shoot celebrating Autumn festivities, with an added touch of Gothic romance. 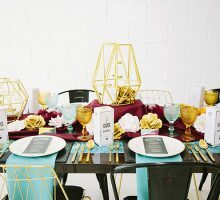 My mind was brimming with colours, ideas and must-have elements, and the only way to incorporate all these was to call upon the talents of our Bride Club ME vendor club members. 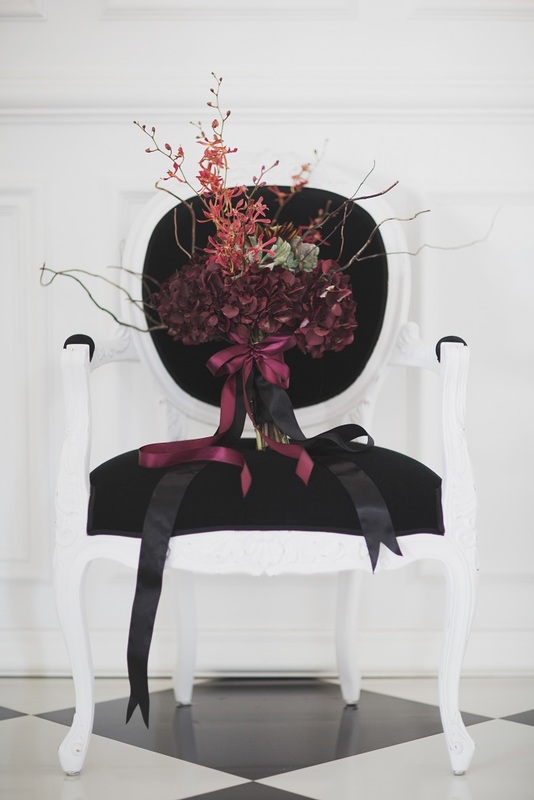 Styled shoots often take on personalities of their own, and it’s never a good idea to be too rigid about this, as each vendor involved will have their own creative interpretations. In choosing the gowns (which were not “typical” bridal gowns), a glamorous touch was added, so we rolled with it. 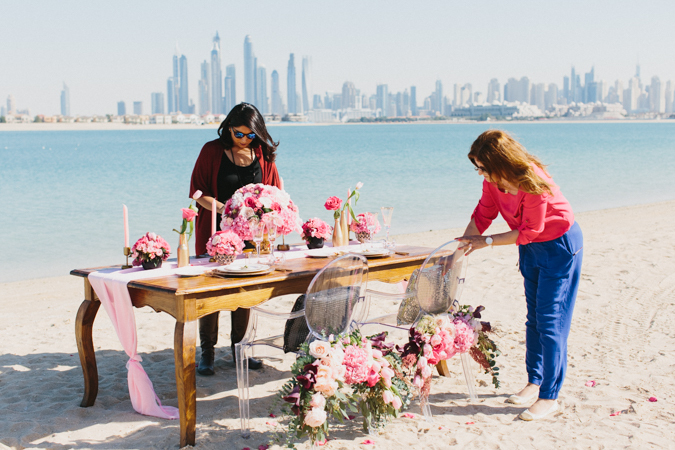 Our styled shoots are created to showcase the incredible work of some of our vendors and to also bring new and fresh ideas to the UAE wedding industry, we don’t expect brides to see these as a bench mark for their own wedding, but if you are inspired by an element or two, then yay, we would love to see how you used the inspiration for your own wedding day. Below are the images captured by the lovely Melissa Beattie, followed by the back story behind the shoot. Enjoy! 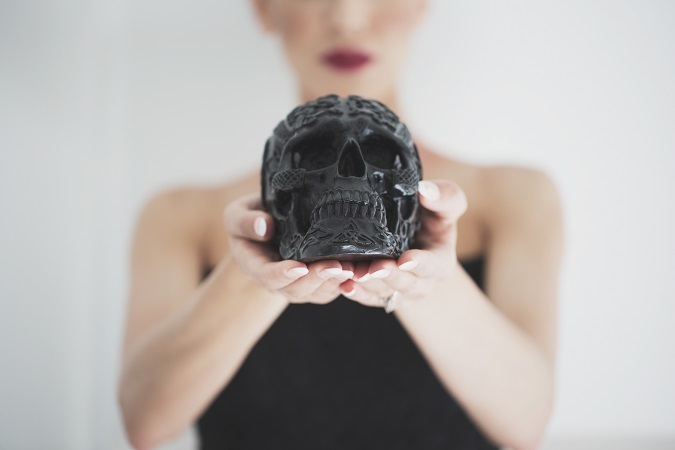 Our shoot took place at the Victoria Strange Couture boutique. I’d met the boutique’s Founder, designer Olga Nurek, and immediately fell in love with the interiors. 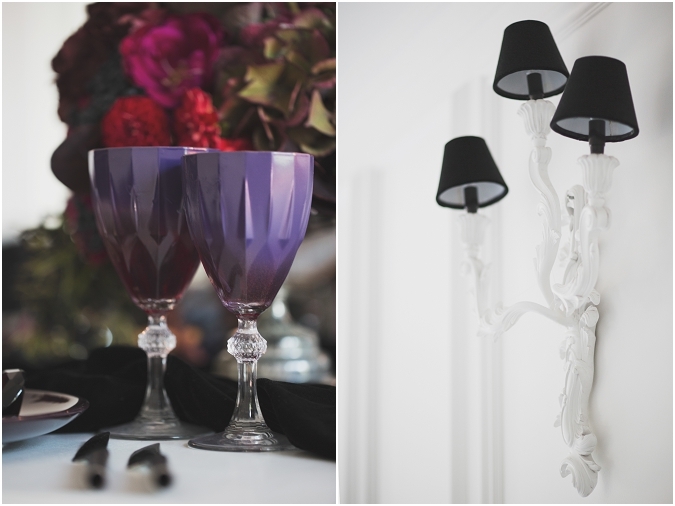 A classy mix of black and white fills the venue, creating an effortlessly elegant feel, with a touch of Gothic throughout. 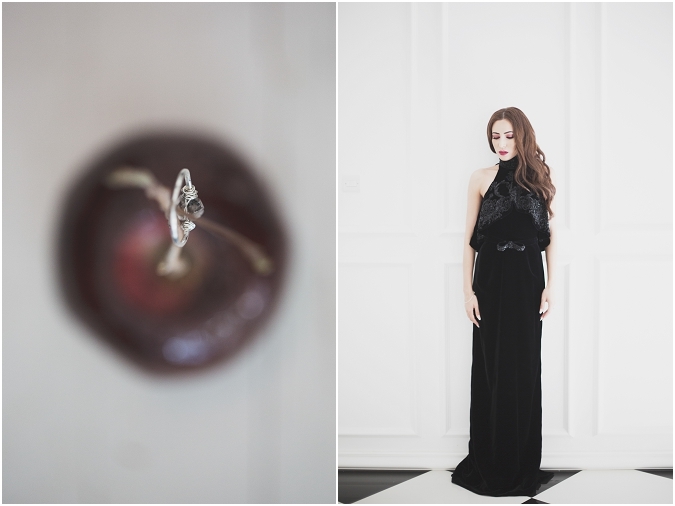 With no attire stylist, I used my imagination to ensure the jewellery, provided by Vitrine Designs, and the hairpiece, by ANAQA, complemented the exquisite black gowns created by Olga. 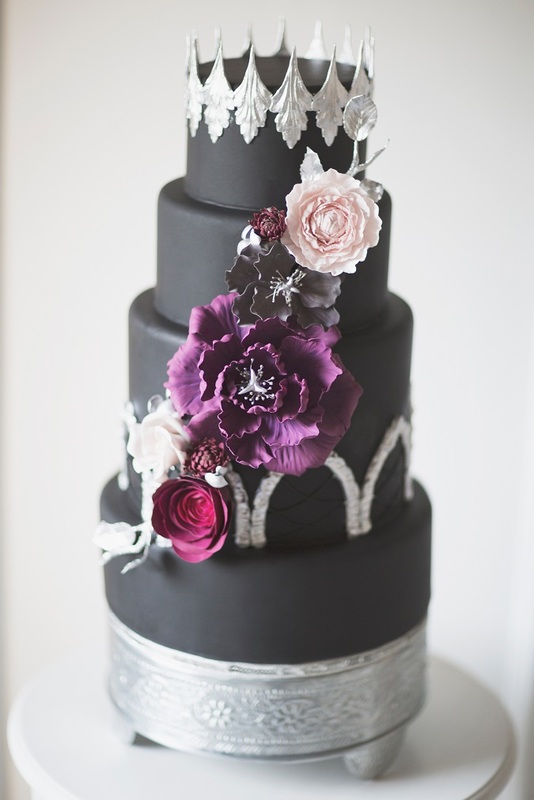 The stunning cake, by the Gourmelicious girls, was inspired by the dark interiors, peaked roof tops and pointed arches of Gothic architecture. 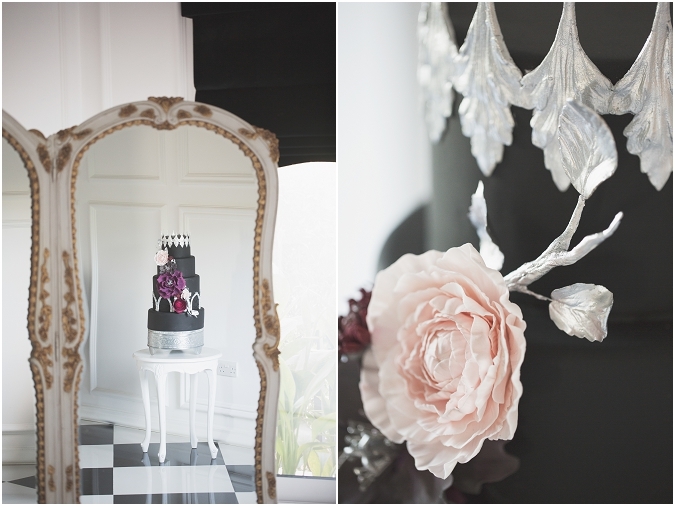 The fantasy-themed plum, grey and burgundy flowers were carefully picked to match the shoot’s colour scheme, and tiny dahlia together with washed out blush roses with silver leaves added the finishing touch. 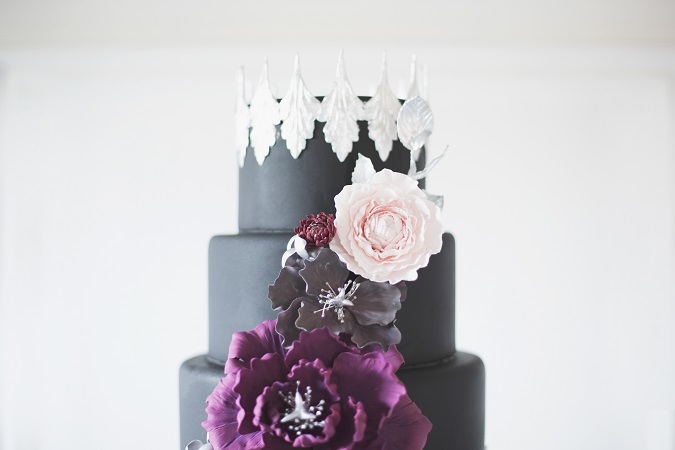 The result was a dark, feminine and majestic cake. 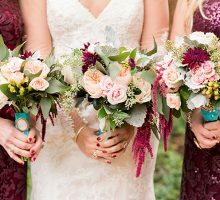 The florals and fauna for this shoot were supplied by one of my favourite florists, Vintage Bloom (who I used for my wedding). As always, their creations were spot on. 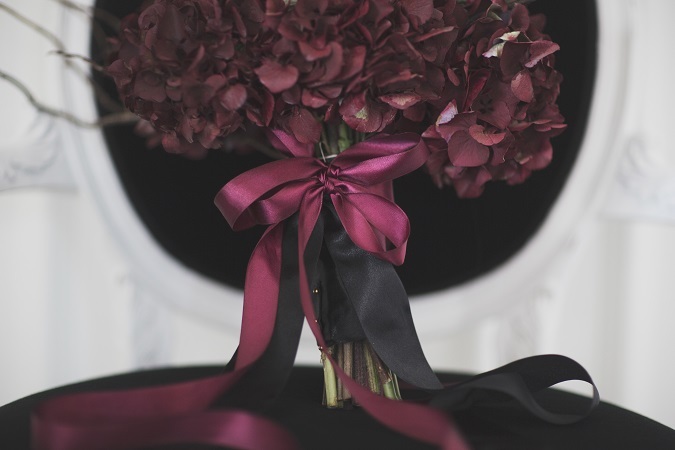 The oversized bouquet and tablescape flowers included black bonny rose, black viburnum, deep red hanging amaranthus and orchids, black sunflowers, dahlias, burgundy hydrangeas, artichokes and an assortment of leaves. 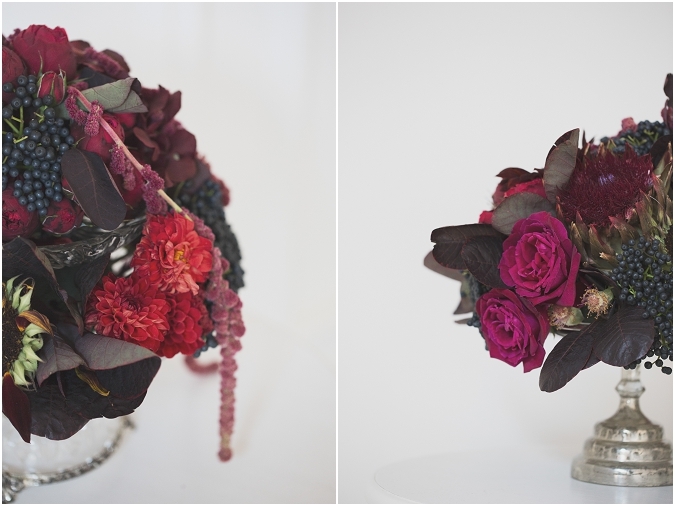 The bouquet also had added succulents, which worked beautifully. 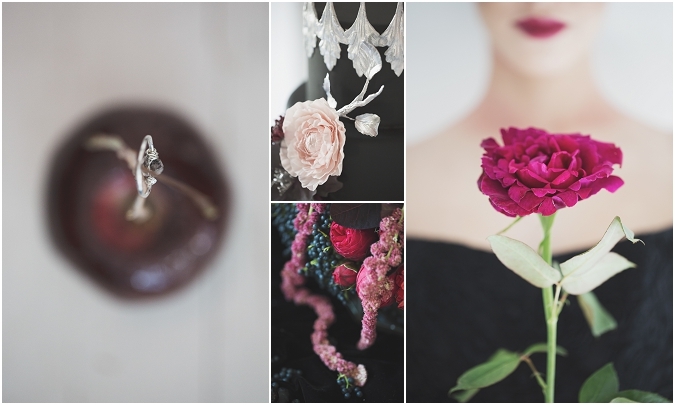 All the above elements were brought together by wedding stylist Joelle, from Lovely Styling. I’ve wanted to work with Joelle for some time and knew she’d bring her special touch to the shoot. Joelle immediately got my vision, and set to work sourcing the tableware and black velvet overlay. 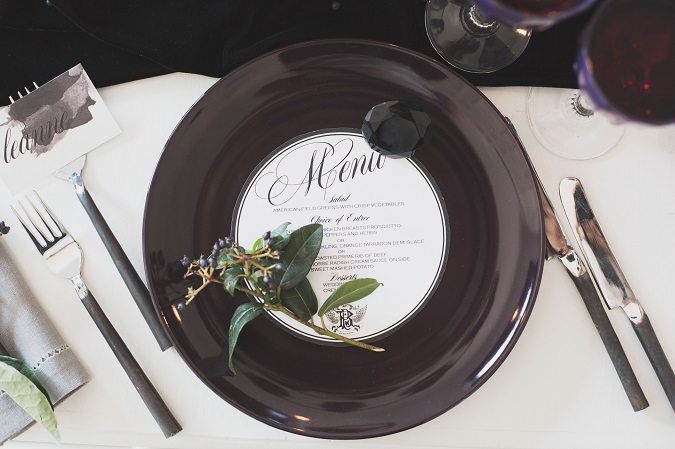 She spray painted challises with a deep plum hue, coordinated with the florist and designed the perfect tablescape. 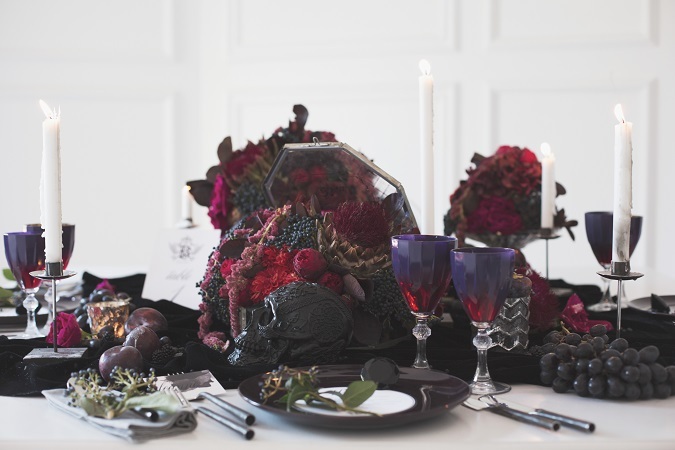 I provided a skull candle of my own, along with a friend’s black skull piece, to give the table some extra flavour, and Joelle purchased lots of black berries and plums, which added an earthy, autumn feel. 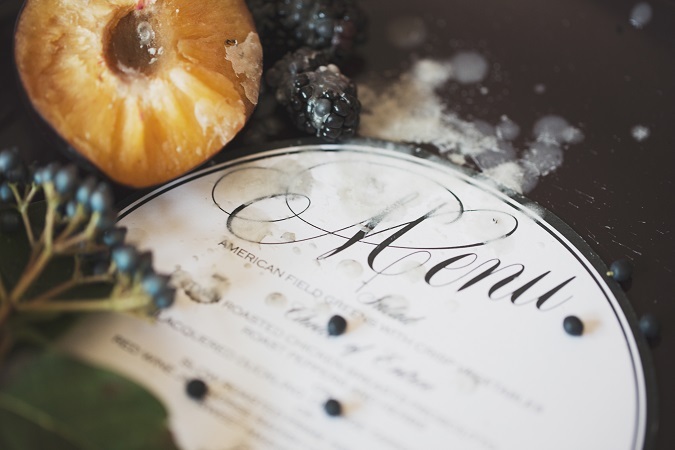 She also delicately dripped candle wax over some of the stationery and fruits to create a lived-in vibe. Joelle also added a few pretty finishing touches to the stationery suite. 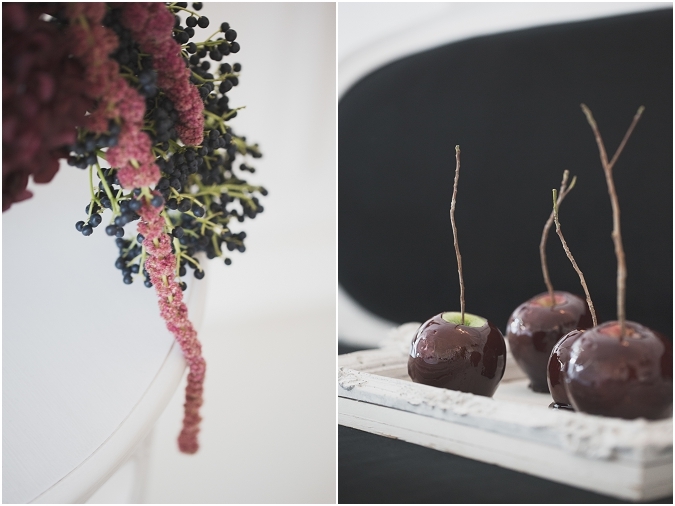 Adding something a little different to our shoot was the lovely Sunny, founder of Sunny’s Pop, who provided delicious toffee apples covered in deep red toffee and combined with real twigs, giving that autumn touch. 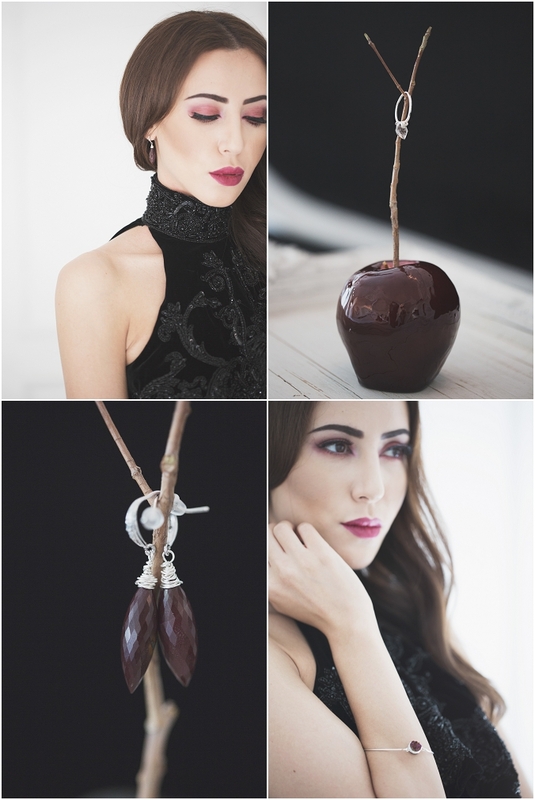 Needless to say, we devoured the toffee apples after the shoot. 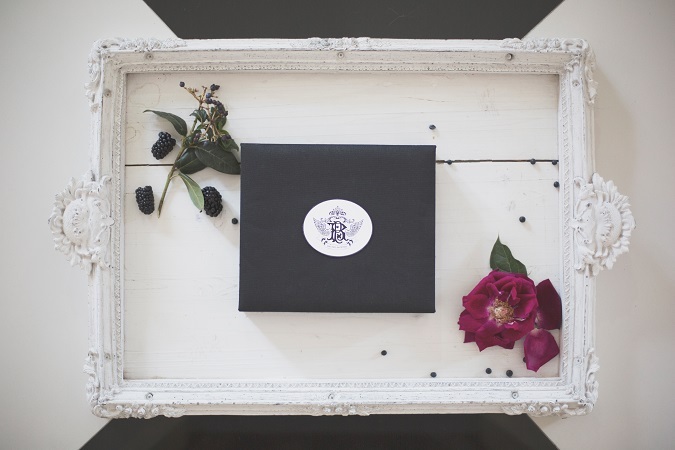 The gorgeous stationery was supplied by Ritu at Creative Box. 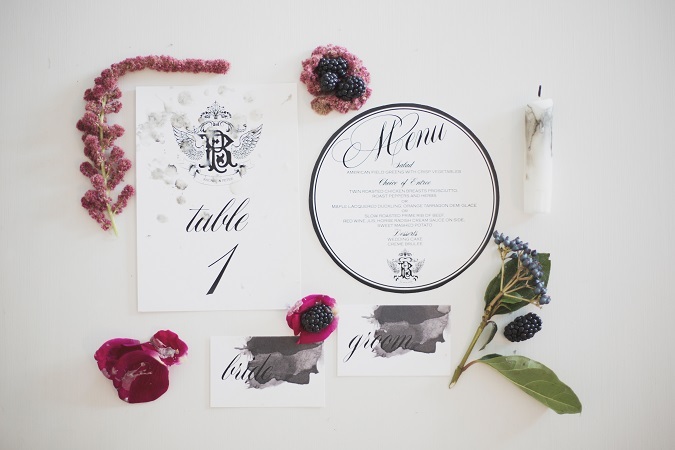 Ritu created a glamorous, Gothic-inspired wedding invitation in keeping with our theme, along with an ornate monogram using Victorian fonts and Gothic prints. 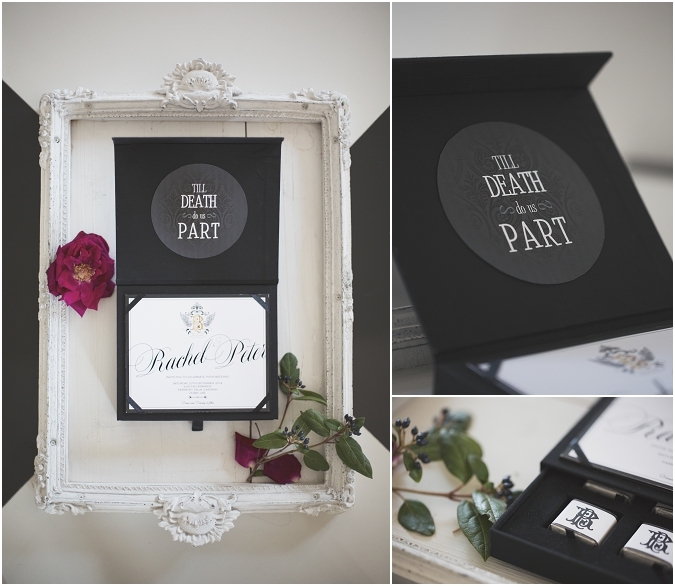 The invitation was printed on thick board for dramatic effect, and placed inside a black box, designed with a surprise element – a drawer containing six, personalised chocolates. To add even more drama, Ritu used watercolours and a beautiful Calligraphy-style font on the place cards, while the menu and table numbers incorporated the designed monogram for continuity. Our wonderful model for the day was Nesrin Adnan, with hair and makeup carried out by the fabulous twin-sister duo Make-up by Dee & Dal. 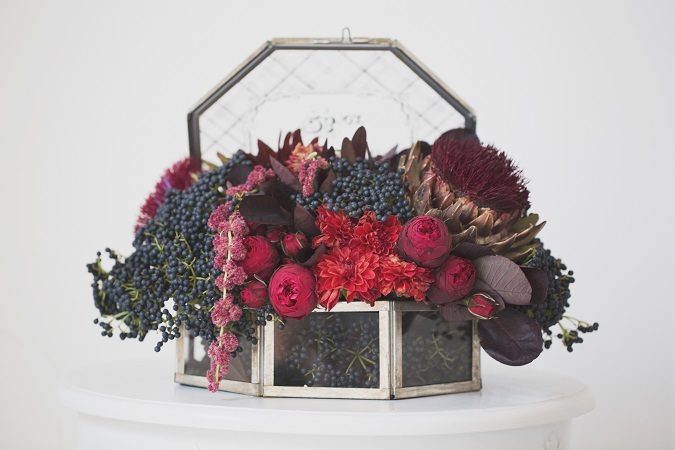 After seeing our florals and dresses for the shoot, Dee & Dal chose eye shadow shades to match the floral arrangement in deep plums, burgundies and maroons and kept Nesrins base, light and flawless, with minimal contouring. The hair for the second look with the black tulle, was kept the loose and lightly waved. For the first high collar look, they scooped the hair up into a messy bun and added the dramatic ANAQA hairpiece, as well as some top gel liner to Nesrins eyes for some drama. It was an absolute delight and a labor of love working on this shoot, with all involved. A little secret of mine: I have a soft spot for anything quirky and outside the box. 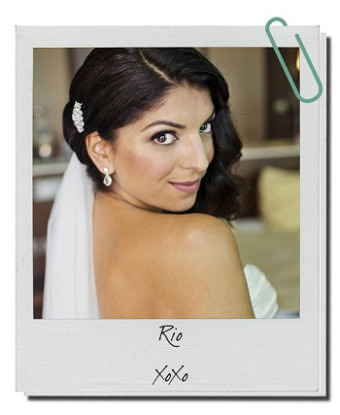 Take note wedding photographers … I’m looking for your submissions (real or styled). I hope you enjoy the images, and please feel free to leave a comment. 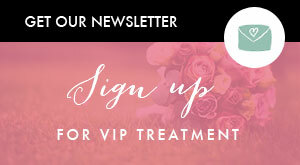 Looking for more wedding inspiration? Click here. I have just looked at your web site and wish i was young again to have this beautiful Gotic wedding so unusual the images were out of this world, the colours blended and was so well put together congratulations to everybody who took part in this fabulous wedding.